The right doors, along with new windows, help improve your home's appeal and make a great impression. When it comes to your home’s entry or patio doors, you want doors that provide security, create a welcoming entrance and will give you many years of trouble-free operation. Pro Home 1 installs new exterior doors in styles and materials to fit your needs. Our professionals will handle the entire process from start to finish – from helping you choose the right type of door to the actual installation. We work with leading manufacturers to provide you with the highest quality products so that you will never have to worry about replacing your door again - unless it's by choice. Call us today at 1-844-801-2465 or fill out our online form for a free no-obligation estimate. If you live in Wood Dale, Schaumburg, Mount Prospect or nearby areas in Illinois, let us help with your home remodeling project! 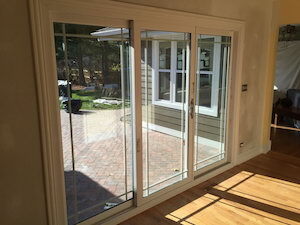 An exterior door can also be a patio door. Patio doors are typically made of glass panels that slide, swing or fold open, and they are used as an entry point to a patio or backyard space off of the kitchen, living room or bedroom. We offer several styles of patio doors for your home. Comfort: A warped, drafty door can make your home uncomfortable and cause your energy bills to rise. A replacement door that's properly installed and sealed will help keep the temperature in your home consistent and reduce the load on your heating and cooling systems. Functionality: Doors that are sticking, uneven, or difficult to open and close should be replaced. We offer maintenance-free materials that will not require painting and will not warp or rot over time. Home value: By replacing old doors in your home, you can increase its value when it comes time to sell. Replacement doors make a huge difference in appearance and home security. Convenience: We make door replacement quick and easy, and it's done at the right cost! We realize home improvement is costly, and we work with you by providing a free estimate so that you know exactly what you're getting. Make a statement. 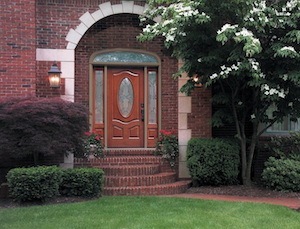 A new front door creates a great first impression for your home. Finding the right door for your home is part of the process, but no door looks complete without the right finishing touches. We can install unique knobs and handles to give you a custom look, and we supply a variety of colors for your door. Adding decorative or privacy glass, transom windows, and sidelights are all great options for improving the look of your door and giving you an eye-catching entryway. We install quality entry doors in custom sizes and finishes. The opening size of your door frame will determine the specific door or glass styles that can be installed. Don't worry about trying to handle a door frame yourself - our expert contractors can help you select the perfect product for your home and provide hassle-free installation. Schedule your free replacement door estimate today! Our doors are custom ordered to ensure a perfect look and fit every time. Contact Pro Home 1 today to learn more about our window and door replacement options and to schedule a free estimate in Arlington Heights, Des Plaines, Wheaton, Palatine, Lombard , Naperville, Elmhurst or nearby.